Paul Casey holed a 30-foot eagle putt on his way to a 5-under-par 66 Friday. 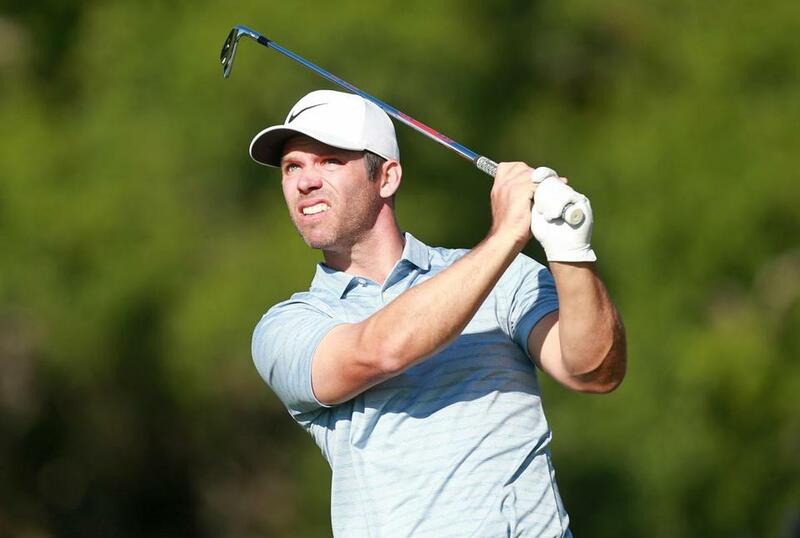 Paul Casey drove into Innisbrook in Palm Harbor, Fla., and saw his picture on posters and programs, just what he needed to forget the cut he missed last week. Casey holed a 30-foot eagle putt on the 599-yard fifth hole and made short birdie putts on the other three par 5s on his way to a 5-under-par 66, giving him a share of the lead with Austin Cook in the Valspar Championship. Also at 4-under 138 was Curtis Luck, the former US Amateur champion and last man in the field when Kevin Na withdrew 30 minutes before his tee time. Luck had never seen Innisbrook until his opening tee shot. ‘‘It does show you what a good job they do with the yardage books,’’ Luck said. LPGA — Sung Hyun Park shot her second straight 6-under 66 at the Founders Cup in Phoenix for a share of the lead with Yu Liu halfway through the second round in the event that honors the 13 women who founded the LPGA Tour. The 25-year-old has six tour victories, winning majors in far more difficult conditions at the 2017 US Women’s Open and 2018 Women’s PGA Championship. ‘‘Definitely being the first off, the greatest advantage is pure greens and calm conditions,’’ Liu said. She was two strokes back with first-round leader Celine Boutier (70), Amy Yang (66), Mi Jung Hur (66), and Nanna Koerstz Madsen (69). European — Ernie Els was two shots behind Maybank Championship leader Thomas Pieters on a crowded leaderboard after the second round in Kuala Lampur. Els carded a 2-under 70 to reach 6 under. There were 15 golfers within three shots of Pieters, who was at 8 under overall after a 69 he wasn’t pleased with. He bogeyed the par-4 second hole, and made four birdies. ‘‘It didn’t feel like a good day to me, I made the best of what I had,’’ the Belgian said. ‘‘I gave myself a lot of chances but I couldn’t seem to get the ball in the hole. After four birdies and two bogeys in his round, Els felt he has ‘‘a chance’’ to clinch a first victory in almost six years. ‘‘The last four years have been a struggle, so I'm really happy that I'm playing good golf again,’’ he said. ‘‘My body feels good and the ball striking is there now. Robert Garrigus became the first PGA Tour player suspended for a drug of abuse, saying on Twitter that he had a relapse with marijuana. The tour announced that the 41-year-old Garrigus, whose only PGA Tour victory was at Disney at the end of the 2010 season, has been suspended for three months. ‘‘After a long period of sobriety, I had a relapse and subsequently failed a drug test for marijuana,’’ Garrigus said. ‘‘Legal doesn’t meant it isn’t addictive and legal doesn’t mean there aren’t potentially severe consequences if you use it,’’ he said. ‘‘I will use this time away from golf to be with my family and work on regaining my sobriety. It doesn’t matter if you are one day, one week or nine years clean; one misstep, one lapse in judgment can impact your life in monumental fashion.